What do you have? A question we all ask ourselves from time to time when we have found a collectible and we don’t know where it came from. 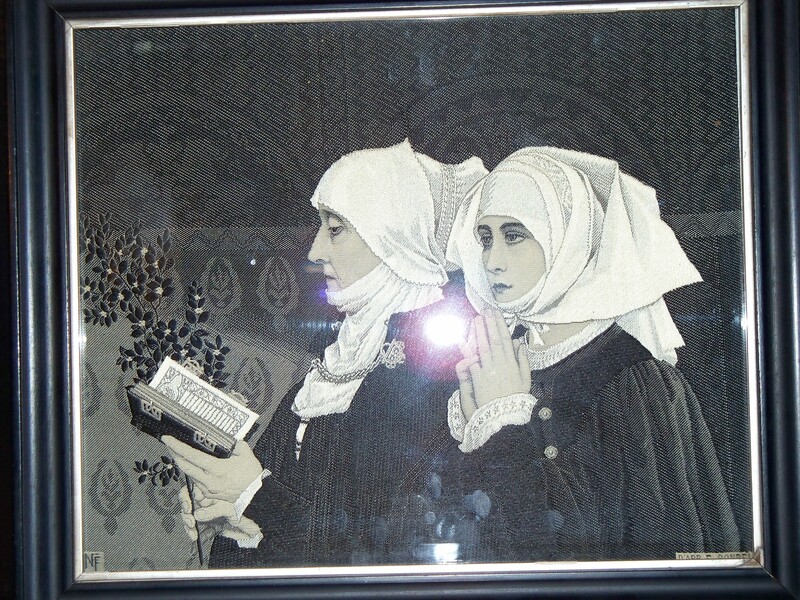 I am going to show you how I did recent research on a collectible I have had for many years, a portrait of two nuns. The first photo was taken outside under natural light and the second inside using my homemade photo lab. I always believed that this print was hand stitched. It looks as though it is when examined closely. I recently decided to market the print and knew I was going to have to research to find out exactly what it was and where it came from. Here is how I tackled the research. 1.) I examined the print closely for Maker’s Marks. No matter what item you are researching pottery, paintings, glass, prints etc. finding the marks are very important. 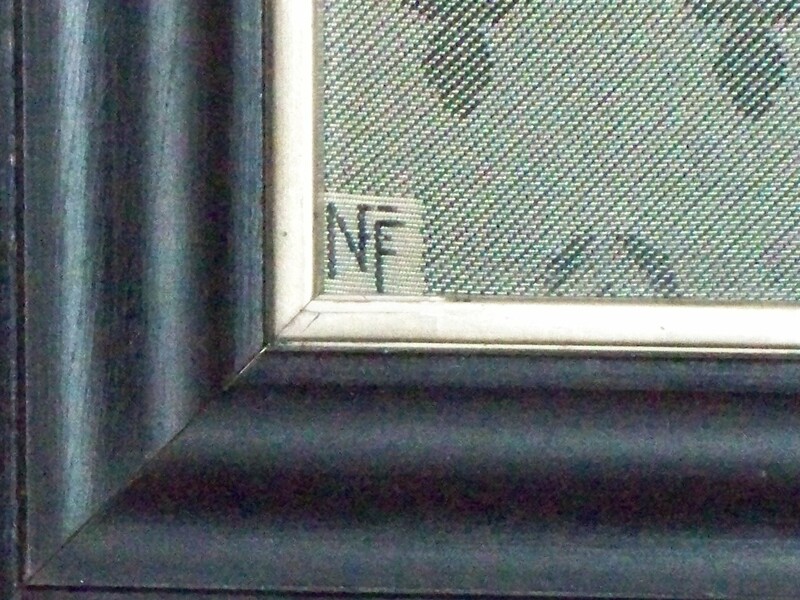 On some peices “No markings” tells the history and maker of the antique or collectible. 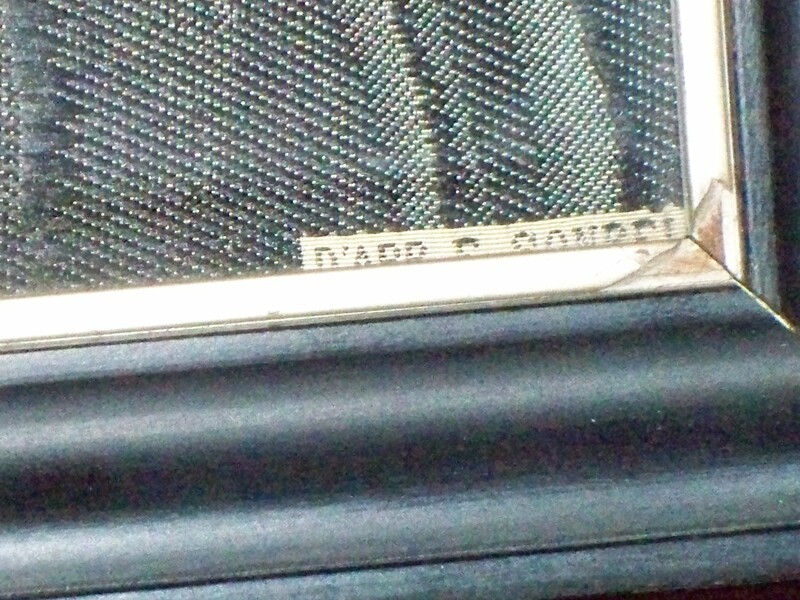 When I examined this peice of history I found NFF woven into the lower left hand corner and D’APR E. Sonrel woven into the lower right hand corner. I had to disassemble the print from the frame to find that information. 2.) With the emergence of computing we now have a full library of information at hand. Although I own a good size library of reference books on the things I collect this was one of those decorative art collectibles I own for it’s beauty and not to build a collection. So I had no books to pour through to determine what it was or where it came from. 3.) I first searched for the name of Sonrel. Almost immediately I came across the name of Stephane Sonrel. A male painter from Tours France in the 1800’s. After reading his bio I learned he had a daughter that he trained in art and her name was….Elizabeth Sonrel. Pretty easy so far. Elizabeth Sonrel also became a known French painter 1874 – 1953. Elizabeth went on to train in Paris under a master artist and displayed her first work at the age of 18. Her paintings are mostly portraits of woman with lots of decorative lace. But what about the D’APR that was woven before her name. I checked my French dictionary. D’Apr means “before”. So this told me that the image had been painted before the print was made and that image was a painting by Elizabeth Sonrel. “Two Nuns Praying”. 4.) I then tackled the NFF. When doing research, it is important not to give up easily or become discouraged. You must have dogged determination. I read many articles, documentaries etc. and opened tons of web pages. I finally found the NFF I was looking for way down on Google’s placement of pages. What I found was a website where three other person’s who had the same peice of artwork that I have (described verbatum) had written to an expert researcher to try to learn what it was. This expert told them they had a “silk screen” that was a print of an E. Sonrel painting. And she gave the name of the company of the Maker’s Mark as Neyret Freres. Eureka! I found it! Joy is the only word to describe an exciting find. 5.) I then expanded my research to include Neyret Freres. Neyret Freres is a French Company that specialized in the making of silk ribbon and operated from the end of WWI and closed before the beginning of WWII. The most interesting thing was that they made Silk Screens on a loom called a “jacquard” loom. But this was not just an ordinary jacquard loom. This was a period when industrialization was flourishing and the Neyret Freres company had a water powered jacquard loom. A very unique and modern peice of equipment at the time. That loom is now retired and housed in working condition at the “Museum of Art and Industry” in France. 6.) My next task was to get a monetary value of this peice. Again, turning to the computer search engines I started to look for auctions that had sold “silk screens”. After considerable search I found not one but two auctions, the last on Feb 6, 2010 of an exact copy of the very screen that I have. And so I had the value of the screen. 7.) I wanted to put the “silk screen” up for auction through my eBay store, so I then researched what silk screens sold for on eBay by using Advanced Search, closed listings as well as active listings. I also used Terapeak, a software program that researches closed sales with values sold for, date as well as number of bids and time of day sold. 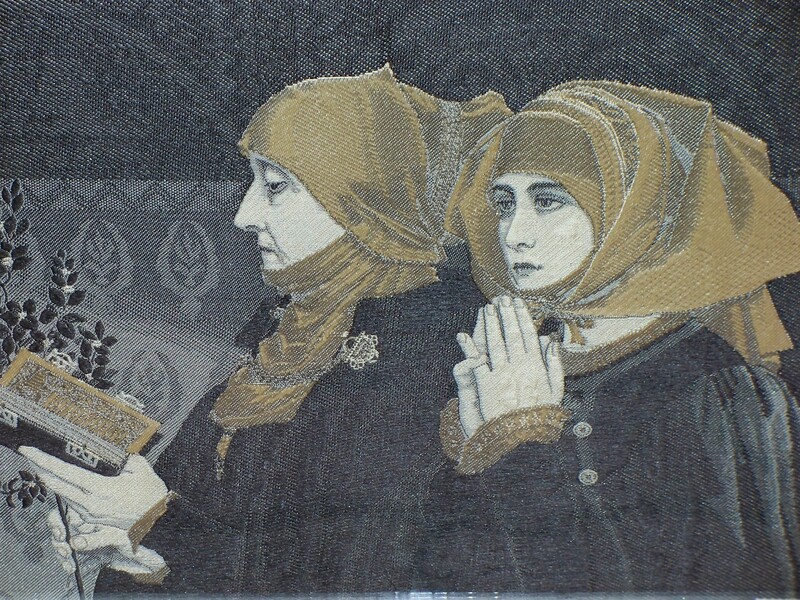 With this information I was able to adequately market my Neyret Freres Silk Screen, “Two Nuns Praying” for a price that I could part with it. For collector’s the research and the finding of exactly what you have, who made it, where it came from and the period in history it is from is euphoric. The best part of being a collector. I am very exicited to learn that I have a silk screen, made on a water powered jacquard loom from the late 1800s, a copy of Elizabeth Sonrell’s work and a religous artifact all in one. Eureka! You can check out my find in my eBay store. Just click on My Assistant Editor (the Duck) in the upper right hand corner of this page to veiw or even purchase this artifact in my store. It has a search feature so put in “Two Nuns” and you have it. So collectors, until next post Happy Collecting and remember the best is yet to come!